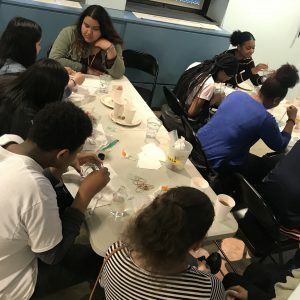 On Wednesday, April 25th, the Penn Museum Teen Ambassadors hosted our second Teen Science Café. Our speaker was Raquel Fleskes, a doctoral student in the Department of Anthropology whose work focuses on using genetics to answer questions about migration and settlement patterns during the colonial period in North America. 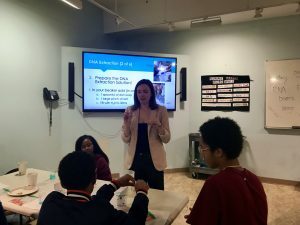 She visited the Penn Museum to talk to teens about the use of DNA in genetics and anthropology, and how while genetic information can tell us a lot about a person and where they may have come from. There are also many things that it fails to tell us about their culture and their heritage. Fleskes began the Café with a background presentation describing her work in trying to classify the DNA of human remains found in archaeological sites from colonial America. This helps to find genetic markers that specify where those people originally came from. She described the findings of one site in particular near Rehoboth, Delaware. Here, her team discovered five individuals of European heritage with very similar genetic markers, suggesting that they were all closely related. They also found three individuals of African heritage with genetic markers from all over the continent. This suggests that they were most likely brought to America forcibly through the slave trade from different parts of Africa. She explained the technical process of DNA extraction, and how it is imperative to keep every surface clean and ones entire body covered so the DNA sample is not contaminated with any other kind of genetic material. Fleskes then led a discussion about the implications of studying the genetics of ancient peoples. We first created a word cloud of all of the words we thought of when we thought of DNA, which ranged from very scientific things like RNA and double helix, to more cultural or personal things like blood and family. We discussed how in our culture, DNA has come to be associated with things like heritage and culture, even though the two are not implicitly connected. 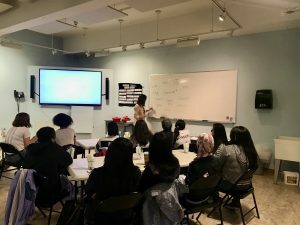 Fleskes led a discussion about the differences between genetics and heritage, incorporating the terms “genetic essentialism” and “objectivity,” and using them to discuss the problems with equating somebody’s genes to their cultural experience. She explained that just because you know where somebody came from genetically, that doesn’t mean you know what their life or their experiences were like. For the activity portion of the Café, we all completed a DNA extraction from a strawberry. Using dish soap, a coffee filter, salt, and ethanol, each teen took a whole strawberry, mashed it up, and synthesized it into just the genetic material. After doing the extraction, we all came back together as a group and discussed how different the white, goopy DNA looked from the way an actual strawberry looked. We discussed how this can be related to humans: we all have DNA, but that’s not what we think about when we think about who we are. Just like how when we think about strawberries, we don’t think about the white, goopy mess, we think about a solid, red fruit. We left the café knowing that even though genetics can tell us a lot about who a person is biologically, it can’t tell us anything about who they are, or were, culturally.